Buy Quest Acidophilus Plus - 60 capsules in the UK from our online shop or directly from our independent Scottish store. 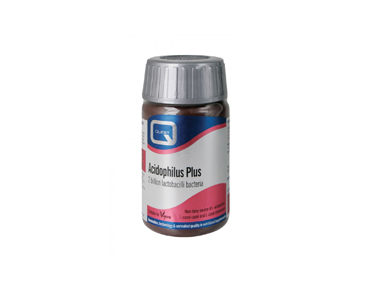 Quest acidophilus plus has 2 billion lactobacili bacteria per capsule. Acidophilus are probiotics, friendly bacteria living in the gut. Friendly bacteria for digestive health. These probiotic capsules are encapsuled in acid resistant capsules. As official Quest stockist, we sell genuine Digestive Aids directly from our shop in Scotland and online throughout the UK. Where can you buy real Acidophilus Plus 60's safely online? If you are wondering where you can buy Quest Acidophilus Plus - 60 capsules safely online in the UK, then shop with us. We are an actual health foods shop; with real people selling real foods and products. Our award-winning independent shop is located in Stirling, Scotland since 1976. You can buy our Acidophilus & Garlic supplements and other genuine Digestive Aids in store or safely place an order with us online or over the phone. Acidophilus Plus 60's - Quest Acidophilus Plus - 60 capsules in Digestive Aids and Herbal Remedies, Tinctures & Supplements.